Pelican Panels recommend the use of Aluminium for all Coastal locations and swimming pool fencing. The range of powder coating colours is very extensive and, in most cases, we can match any existing exterior paint colour in today’s market. 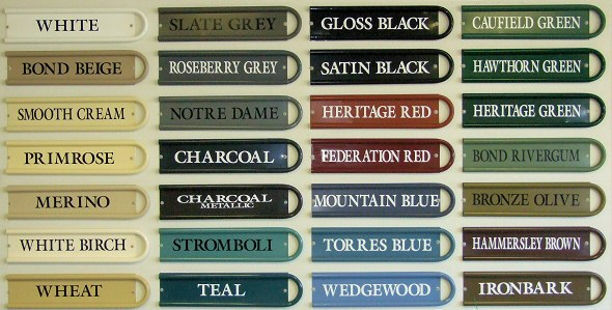 Powder Coating colours are available from several suppliers which have the same colour ranges although they may not have the same name or code. Pelican Panels use Dulux colour ranges. A powder coated finish is recognised as one of the most durable surfaces available and depending on its installed location and regular maintenance, you can be assured of a great looking finish that will last for many years. Note: Powder manufacturers do not offer a warranty on coatings on steel or hot-dip galv within 5kms of a coastal location. Pelican Panels recommend the use of aluminium for all coastal locations. It is critical that Aluminium goes through the proper pre-treatment process prior to powdercoating to maintain longevity of the powdercoated finish. A solution of hot water and iron phosphate with special detergents is used to remove dirt and oils. This leaves the galvabond tube with a protective iron phosphate coating. Panels are then placed on an overhead line ready for powder coating. The powder is applied by an electrostatic hand gun. All panels and fittings are batched by colour and loaded into the gas oven for firing. A thermostat reaction occurs at 200 degrees centigrade, melting the powder. As the oven cools the molten powder hardens to form the cured layer of colour coating. In addition to the techniques used in steel coating, the following preparation is used for aluminium. A 5 stage pre-treatment process of aluminium products is required prior to powder coating. This involves panels being submerged in various chemical solutions for a specified time as set out in AS3715. Check out our life-sized wall display to select your colour. MAINTENANCE OF YOUR TUBULAR FENCE / BALUSTRADE. Cleaning of your investment is desirable if the powder coat finish is to be preserved. Deterioration of the coating occurs mainly as a result of ultraviolet light, grime deposition and attack by contaminated moisture. A coastal environment contains chlorides & an industrial and urban environment, chlorides and sulphur compounds. Deposited grime absorbs moisture like a sponge and holds it against the powder coated surface, this permits the corrosive attack to proceed, thereby damaging the coating which cannot be restored without removal. General Conditions: Where grime deposition and pollution are at a minimum, cleaning every three months is sufficient to remove deposits and restore appearance. Industrial & Marine: In this type of environment monthly cleaning is advisable, however, the maximum period between cleaning’s should never be more than three months. Under the worst conditions involving heavy grime deposition and atmospheric pollution by both sulphur compounds and chlorides even more frequent cleaning is advisable if deterioration of the coating is to be prevented. Carefully remove any loose deposits with a wet sponge. Use a soft brush( non-abrasive ) or cloth and a mild pH-neutral detergent solution to remove dust, salt & other deposits. Rinse off with clean fresh water. Avoid spraying your fence with chemical garden sprays or bringing into contact with fertilisers, garden mulch, compost etc. Keep fence panels clear of soil – it is beneficial to maintain a gap between fence and ground at all times. Do not use harsh detergents, steel wool, scrapers, scouring liquids or powders to remove deposits as these permanently scratch the coating surface. If surface damage accidentally occurs this can be rectified by lightly sanding the area, spraying touchup paint into the lid and apply with a small brush. Download this Maintenance information as a PDF to print.